Every two minutes, a child dies from malaria. A mosquito net is a completely affordable and easy way to prevent such a painful loss. The UN Foundation’s Nothing But Nets campaign to defeat malaria has delivered close to ten million nets to local agencies and partners in sub-Saharan Africa. There’s no doubt that this saves lives. Today, I’m excited to share that Classy’s technology is powering Nothing But Nets World Malaria Day campaign: #CallYourShot. We’re extremely proud to be a partner in this clever and engaging campaign on such a pressing global health issue. Malaria is a deadly disease, but it is preventable, which means we hold the power to end it. 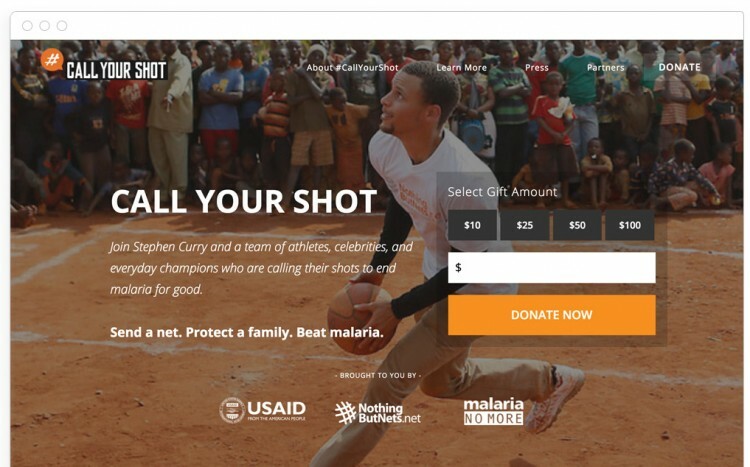 Please join President Obama, NBA Most Valuable Player Stephen Curry, and other athletes and partners in supporting the fight to defeat malaria. How does it work? Visit www.CallYourShot.org to donate, then film yourself calling your own shot (in basketball or any other sport) and post it to your social media channels to spread the word. Now it’s time to call yours! Visit www.CallYourShot.org to support the campaign and call your own shot!